I found the declarative nature of Webpack appealing to the non-architecture developer that needs a build system without having to manually layout the entire process. However, in order to expand my knowledge I decided that proceeding with a Webpack build was insufficient. I decided to embark on switching my build system over to Gulp so I would have a balanced perspective on the pros and cons of each. My initial experience with Webpack started with researching how to compile ES6 code for compatibility with older browsers. I had heard of Babel before and used the instructions there as the launching point for my previous Webpack build. My plan for Gulp was starting with the Babel instructions and proceeding from there. This is where the difference between Webpack and Gulp became readily apparent. With Webpack I didn't need to specify anything other than the entry point to my app in the loader, and a fully compiled package was outputted. With Gulp I realized that transforming ES6 into older code was only part of the equation. After completing my initial Browserify build the next step was finding a watch system for file changes. I had used gulp-watch for LESS projects, but a companion module to Browserify called Watchify. The implementation was different from gulp-watch in that the Browserify call is passed to Watchify, as opposed to the typical Gulp flow that I've implemented before: piping data from one call to another. Instead of a pipe() I was surprised to see a call resembling a jQuery event listener .on() declaration. Overall, Watchify reminded me of Webpack's build system a bit in that the actual mechanics are somewhat obfuscated. Having Watchify take care of monitoring the build source and triggered a new Browserify bundle was all well and good, but I disliked the number of requirements I was introducing into my application at this point. I decided to switch to a standard gulp-watch for the sake of simplicity. Diving into the pros and cons of Watchify vs gulp-watch, I would sum up my takeaway as a matter of efficiency versus simplicity. With Watchify there is a focus on only loading what has changed and building incrementally; Gulp watch is focused on simply looking for file changes and then executing the same build process over and over again. Compared to Webpack, Gulp was a much more down and dirty way of setting up a React build. The task of assembling all the different gulp modules made it much more challenging than Webpack's declarative based configuration. Personally, I can understand why a lot of the top results for React builds used Webpack instead of Gulp. Ultimately the choice of build system will of course depend on what people use in their organizations or what people they are collaborating with are using. Diving into ReactJS, I began with a recommendation to check out a course by Wes Bos. After doing the tutorials, I decided to take a different approach to prototyping than the one I took when I first developed with MeteorJS. My Meteor experience involved taking a tutorial I had done and using that as a launching pad for a Twitter parser. In the following post I describe the highlights of how I got a React build working from scratch based on the documentation. At the end of some sections I have provided a link to the Github branch so you can see the state of the code at that point. My next challenge was figuring out how to speed up the development process so that I would not have to invoke the Webpack build process using the command line every time I made a file change. With Gulp I was familiar with the concept of watchers that trigger Gulp tasks whenever file changes are made. Given Webpack's settings approach I came back to the command line and introduced myself to the watch functionality. The method above worked well for compiling the static JS, but the matter of serving the files still remained. For simple projects I generally use the basic Python http server. The Webpack dev server, on the other hand, appealed to me since I could take care of compiling, serving content, and refreshing the browser in one package. After splitting my code into modules, I decided the next step would be connecting input to output. In order to accomplish this I created a new module for form inputs and made a TextInput component. I placed a callback in my project base and passed it into the TextInput component. This allowed me to change the application state from the TextInput module and automatically display the latest data on my app's homepage. After getting a basic site structure built, it was time to learn how to set up the styling system. I have used a lot of different CSS processors and LESS is still my favourite one. Configuring LESS in Webpack proved to be more complex than Gulp, however. This was one of the cases where I needed to fall back on the documentation extensively. The first step was getting styles to show up on the page using the simplest method possible. I used the Webpack less-loader to accomplish this. To get the CSS into it's own file, I was introduced to the concept of extracting data from the bundle. I eventually settled on using the ExtractTextPlugin. This step seemed somewhat counterintuitive to me, since Webpack is bundling all of the code only to have some of it extracted for styling purposes. 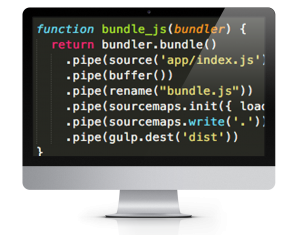 With Gulp I was accustomed to have different processes for handling JS and CSS tasks. The one downside that I've countered so far is that CSS to LESS mappings appear to be specific only to the top-most selector, which means I could have a selector 100 lines down in the LESS while the mapping points to the parent selector on line 3. This is only my first observation of mappings of course, which I know from using JSX -> JS can vary in precision. After having used Gulp to automate simple build processes and Webpack for React JS, my opinion is that while Gulp may require more skill when it comes to crafting the build process with all the methods involved it is still easier for me to understand. Webpack processes, on the other hand, felt more obfuscated behind the declarative nature of the configuration. For my next experiment I want to switch my build system over to a Gulp process while maintaining my current compiled output (JS and CSS).